Not everyone will appreciate the customization that has gone into today’s Nice Price or Crack Pipe Volvo. Then again, not everyone can be as awesome as it is. Let’s see if its price reflects its stature. Looking back on the somewhat apathetic response to yesterday’s 2003 Jaguar S-Type R one has to wonder how long it will be before the model completely fades from our collective consciousness. Unreflective of any particular zeitgeist even in hot-to-trot form, the S-Type simply doesn’t elicit much passion or even acknowledgement. The middling response extended to the Jag’s $9,500 asking price. That was on the high end for the model and market, but then the car was presented as lovingly maintained and little needing. In the end that was enough to push it over the top in an exceedingly narrow 54 percent Nice Price win. Okay, today we are leaving the land of the lovingly maintained and are moving into the realm of batshit crazily modified. To that end, I present to you the 1980 Volvo 242DL SPORT 2DR CONV. Okay, alright, settle down people, there’s enough to go around. Yes, this custom brick is amazing. And yes, someone is actually offering for sale—YOU COULD BUY IT. The question is, should you? There’s not much to go on in the ad as to the car’s origin, so let’s just assume it to be a gift from the gods for our continued undying fealty. That seems logical, don’t you think? The car apparently started out as a humble 242DL two-door, the rarer of the 240-series three major body styles. At some point in time the roof was removed allowing for alfresco dining at all major drive-thru restaurants. In place of the tin top there is now what seems to be a Porsche 914-esque Targa roof, beneath which sits a roll-over bar with seatbelt mounts. Scoops, vents and stripes bedevil the bodywork on all sides while a hood-mounted airscoop looks ready to swallow holiday packages whole. My favorite part of the car however, is the nose. It’s been leaned forward and fitted with Dame Edna eyeglass frames around the headlamps with a mesh grille in between. And here’s the best part—those headlamps are set back behind a black mask on either side. Yes! This car is like a masked avenger or something. I also like the fact that it looks kinda like a sixties-era Triumph Vitesse too. What the looks seem to be masking is a fairly stock drivetrain made up of a 107 horsepower B21 four and M46 4-speed manual with Laycock-de-Normanville J type overdrive. Like all superheroes, the car is dutifully rear-wheel drive. The seller notes that the car is fuel injected and comes with a panhard bar, so you can take comfort in knowing that he’s checked off pretty much all the major selling points. The custom red paint looks top notch, and while the back seat has been sacrificed for the custom top, it’s probably waiting in Valhalla for future reunification. Deep dish five-slots underpin and mask disc brakes at each corner. No mileage is given, but the car does apparently come with a clean title. Hopefully it’s for its alter ego. The asking price for all this awesomeness is $7,500, and it’s safe to say you’re not going to run into another opportunity like this at pretty much any price any time soon. You’ll still need to decide if this custom Volvo can save the day at that price. 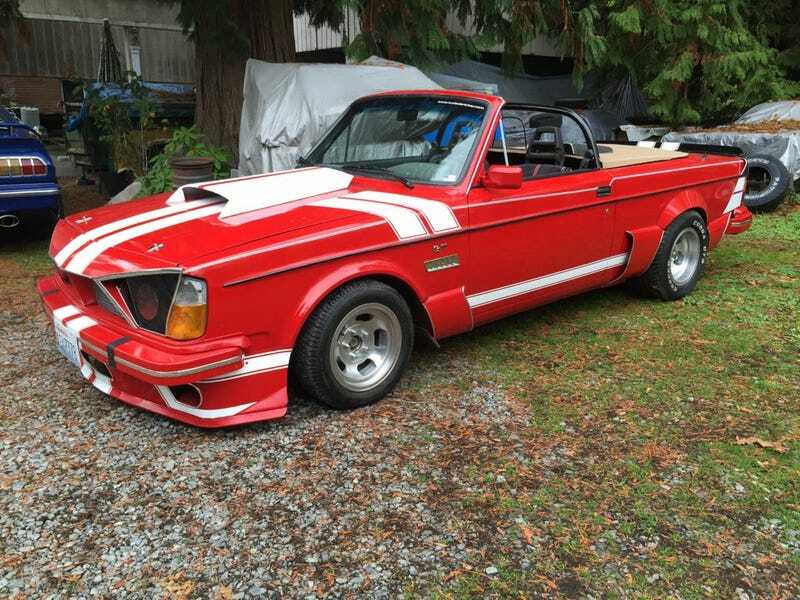 What do you think, does this convertible brick rock your world at that $7,500 asking? Or, is it just not super enough to be your hero? H/T to Dead Elvis and Matt Rahke for the hookup! At $9,500, Could This 2003 Jaguar S-Type R Turn You Into a Cat Lover?